Andrei Arsenyevich Tarkovsky (Андре́й Арсе́ньевич Тарко́вский) (April 4, 1932 - December 29, 1986) was a Russian Soviet film director, opera director, writer, and actor. He is generally regarded as the most influential filmmaker of the post-war Soviet era in Russia, and one of the greatest in the history of cinema. Tarkovsky, son of the prominent poet Arseny Tarkovsky, was a product of the golden era of Soviet arts education. He was born and spent his childhood at the village of Zavrazhye in Kostroma Province. Born into Stalin's Russia, little is known in detail of his early life. Three things, however, were present that were to be important to his future film career; music, volumes of poetry, and illustrated art books and sacred images from the Russian Orthodox Church. Although the house where he was born is under the waters of the Gorky Reservoir, there is a museum dedicated to him in his native village. Tarkovsky received a classical education in Moscow, studying music and Arabic, before training for over five years at the State Institute of Cinematography, studying directly under Mikhail Romm, among others. For a time, he worked as a geologist in Siberia. From his early years, Tarkovsky expressed a desire to use the medium of film not only as entertainment or a sophisticated vehicle of propaganda, as Lenin had proposed, but as a means to speak to the soul of modern humanity. He once wrote that: "Art is born and takes hold wherever there is a timeless and insatiable longing for the spiritual." Tarkovsky's use of ambiguous images, Orthodox Christian themes, and a sometimes brutal realism caused friction between himself and his sponsors. This led to interference and occasional suppression of the finished product by the Soviet authorities; yet it was also the Soviet Mosfilm studio system that enabled him to make films that would not have been commercially viable in the West. Tarkovsky's principal complaint about his treatment by the authorities was that he had many more ideas in him than he was allowed to bring to the screen. He made only seven major films in the course of a twenty five year career. In 1984, after shooting Nostalghia in Italy, he decided not to return to Russia. He made only one more film, The Sacrifice, a European co-production filmed in Sweden, before dying of cancer in a suburb of Paris, at the age of 54. Andrei Tarkovsky, in spite of many setbacks, had worldwide influence. Ingmar Bergman remembered him as the finest contemporary filmmaker. He was buried in a graveyard for Russian émigrés in the town of Sainte-Geneviève-des-Bois, Île-de-France, France. The inscription on Tarkovsky's grave reads, "To the man who saw the Angel." Tarkovsky, both in his life and work, is not easy to classify. His treatment in film of the human condition was both very personal and universal, quintessentially Russian and transcultural. He saw himself in an almost sacramental role as a mediator, through images and symbols, between the seen and unseen worlds. "The artist is always a servant, and is perpetually trying to pay for the gift that has been given to him as if by a miracle… True affirmation of self can only be expressed as sacrifice." Certain themes tie Tarkovsky's films together, although they take place in a widely divergent spectrum of times and places. There was commonly a wide public arena contrasted with the very intimate world of his main character's inner experience, all of which go through a spiritual crisis. There is generally an exposure to the elements of nature in a powerful way, as if to contradict humanity's illusion of separateness from the forces of creation. In Andrei Rublev, the audience sees snow falling into a church after a brutal raid by the Mongols. In both Solaris and Mirror, rain falls into the inside rooms of the main character's home. The four elements are an active field against which the human drama is enacted. Many of his films use stream of consciousness narrative rather than following conventional plot lines. Scenes often appear disconnected to viewers unaccustomed to Tarkovsky's style. Frequent flashbacks and jumps in time are the norm. His internal logic is more that of a Japanese Haiku, determined as it is by loaded images, than that of a linear, rational plot line. Several themes appear and reappear throughout Tarkovsky's films. There is the interpenetration of everyday reality with the metaphysical realm. Things are never only what they seem to be. Ordinary domestic scenes turn suddenly into dream and memory images. This is seen for example in "Mirror" where the reflective glass often becomes a passage into another world or time. Another major theme could be called 'the confrontation with otherness.' A character encounters someone who both expands and contradicts his view of the universe. In Solaris an astronaut meets an alien life form who has taken the form of his dead wife. In Andrei Rublev, the artist-monk encounters a woman engaged in pagan fertility rites condemned by the church. The hero in The Sacrifice must sleep with a witch to avert a nuclear catastrophe. Alienation and fractured eros appear as frequent subjects, reflecting some of Tarkovsky's own painful experience with human relationships. His parents divorced at an early age. His own first marriage sadly disintegrated after only a few years. In Mirror, couples, both past and present, drift toward separation. In Solaris, the hero is haunted by his wife's suicide, for which he feels guilt and regret. Death and redemption are perhaps the great unifying threads in all of Tarkovsky's work. It is this final redemption that make his films uplifting in spite of the somberness of much of the material. After years of silence and despair, Andrei Rublev finds his deeper creative self. In Nostalghia, the dying Yankovsky follows the prompting of a madman in carrying a lighted candle across an empty swimming pool in a symbolic act to save humankind. This taps into the very Russian concept of the divinity of "the holy fool" whose crazy simplicity holds redeeming power. Recurring symbols can be seen in the films. A jug of milk shattering on the floor heralds a moment of crisis. Levitation, either because of weightlessness, as in Solaris, or with the help of helium balloons, as in Andrei Rublev and Mirror, appears frequently. Coins falling to the ground in several film hint at the bargains and sacrifices made in moments of desparation. In Tarkovsky's words: "We are like Judas, accomplices in a crime of universal magnitude and in profound need of redemption." In all the films the forces of nature in general are charged with symbolic overtones although there is a haunting ambiguity which seems to play on the subconscious mind. Wind, rain, mud and fire carry cryptic messages as well as the dialogue. Tarkovsky himself parallels his cinematic creations in many ways and is remembered as an individual who fought to maintain creative control. This is most evident during his fight to have Mirror released despite the severe criticism he knew would accompany such a film's release. This film tells the story of his life as a child, juxtaposes Soviet history, and the life of his mother. Furthermore, it made evident his growing discontent with the restricting policies of the Soviet Union, which often hobbled his creative efforts. That he managed to struggle above these restrictions is a testimony to his energetic genius. Tarkovsky developed a theory of cinema that he called "sculpting in time." This was characterized by often extremely long takes unfolding as if in real time. By using long takes and few cuts in his films, he aimed to give the viewers a sense of time passing, time lost, and the relationship of one moment to another. One often feels as they had "lived through" a film at the end. Up to and including his film Mirror, Tarkovsky focused his cinematic works on exploring this theory. After Mirror, he announced that he would focus his work on exploring the dramatic unities proposed by Aristotle: A concentrated action, happening in one place, within the span of a single day. Stalker is, by his own account, the only film that truly reflects this ambition; it is also considered by many to be a near-perfect reflection of the sculpting in time theory. In his life and in his work, this Russian visionary upheld the value of the individual spirit against the overwhelming wasteland of depersonalized mass society. "…it seems to me that the individual today stands at a crossroads, faced with the choice of whether to pursue the new technology and the endless multiplication of material goods, or to seek out a way that will lead to spiritual responsibility, a way that ultimately might mean not only his personal salvation but also the saving of society at large; in other words, turn to God." 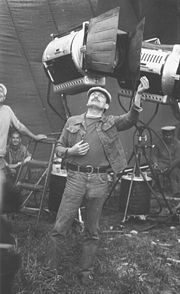 Tarkovsky left many ripples throughout the world of cinematography both during and following the close of his life's work, in 1986. His concern for spiritual questions echoed in powerful images would be manifested in many films after him. Ingmar Bergman, who handled similar questions in his filmmaking and knew Tarkovsky, called him the foremost filmmaker of the twentieth century. Bela Tarr (Satantango, 1997) was a direct imitator of Tarkovsky, though quite nihilist in his attitude, as opposed to Tarkovsky's essential faith and sense of transcendence. After his death, his films, banned from the screens in the USSR, were given back to the Russian public and his life's work is now celebrated and examined both in his homeland and around the world. The Killers (1958)—Tarkovsky's first student film at VGIK, the Soviet State Film School. Based on the Ernest Hemingway short story. Concentrate (1958)—Tarkovsky's second student film at VGIK, the Soviet State Film School. There Will be No Leave Today (1959)—Tarkovsky's final student film at VGIK, the Soviet State Film School. The Steamroller and the Violin (1960)—Tarkovsky's graduation film from VGIK, the Soviet State Film School, cowritten with Andrei Konchalovsky. My Name is Ivan/Ivan's Childhood (1962)—Winner of Golden Lion for "Best Film" at 1962 Venice Film Festival. Set in the Second World War, this is Tarkovsky's most conventional feature film. In spite of this there is an unusual focus on the personal, inner world of the young boy who acts as a spy against the German invaders. Andrei Rublev (1966)—An epic based on the life of Andrei Rublev, the most famous medieval Russian icon painter. The artist-monk gives up his painting career and takes a vow of silence after a devastating raid by Mongol horsemen. He finds redemption through a boy who risks his life to create a massive bell for a village church. Solaris (1972)—based on the science fiction novel by Stanisław Lem. A team of scientists orbiting a planet covered by a "sentient ocean" encounter the weird phenomenon of their loved ones appearing on the space station as projections of their own thoughts and memories. Mirror (1975)—A loosely autobiographical reconstruction of key scenes in Tarkovsky's life, the film he'd tried to make earlier but abandoned for Solaris (one can note thematic ties between them). Said by Tarkovsky to be closest to his own vision of cinema. The theme of mirrors as passages between different times, as well as between dream and waking reality, runs throughout the film. Stalker (1979)—inspired by the novel, Roadside Picnic, by Arkady and Boris Strugatsky. Here a group of people are led through a realm called "The Zone." Its hidden language holds the key to keeping the flame of the human spirit alive within them. Voyage in Time (1982)—a documentary made for Italian television while scouting locations for Nostalghia with Italian co-writer (and frequent screenwriter for Michelangelo Antonioni) Tonino Guerra. Nostalghia (1983)—A Russian scholar retraces the footsteps of an 18th century Russian composer in Italy. An encounter with a local lunatic—a man who believes he can save humanity by carrying a lit candle across an empty swimming pool—crystallizes the poet's melancholic sense of longing for his family, faith, and homeland. The Sacrifice (1986)—The film is about the prospect of nuclear annihilation and man's spiritual response to this. The hero is charged with the bizarre task of sleeping with a witch in order to save mankind from an atomic disaster. Hunter-Blair, Kitty, trans. Sculpting In Time. 1987. Hunter-Blair, Kitty, trans. Time Within Time: The Diaries 1970-1986. 1993. Powell, William and Natasha Synessios, trans. Collected Screenplays. 1999. Johnson, Vidat and Graham Petrie. The Films of Andrei Tarkovsky: A Visual Fugue. Indiana University Press, Bloomington & Indianapolis, 1994. Hancock, Stuart C. Andre Tarkovsky—Master of the Cinematic Image. Mars Hill Review 4, winter/spring 1996. Nostalghia.com: Comprehensive website on Andrei Tarkovsky and his works. Andrei Tarkovsky at the Internet Movie Database. The Genius of Andrei Tarkovsky by Alan Pavelin. The Man Who Saw an Angel. This page was last modified on 20 March 2016, at 19:12.